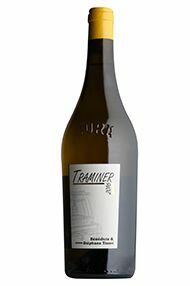 Stéphane’s non-oxidative rendition of the Savagnin grape bears the name Traminer – a common synonym, which flags its relationship to Gewürztraminer (which may have mutated from Traminer/Savagnin). Complex and powerful, herbal and musky notes are backed up by waves of super-ripe citrus and orchard fruit segueing from nose to palate. Drink now to 2022. What a delicious, thought-provoking cuvée this is! The grapes hail from a single, 20-year-old parcel of vines on clay soils in the appellation of Arbois. After harvest, they are macerated for four months in 420-litre amphorae. The wine is then transferred to barrel for three months’ maturation prior to bottling without filtration or SO2. The result is a fascinating bouquet – including aromas of marmalade and dried herbs – and a tannic, grippy mouthfeel, more akin to a red wine than a conventional white. Drink now to 2023. The nose of this wine is beguiling, with a combination of red fruit, floral and smoky aromas – enhanced by Stéphane’s decision not to de-stem this cuvée. A relatively short maceration in large tapered (tronconique) casks was followed by a year’s maturation in barrels (a third of them new). There’s a voluptuousness and richness to the palate, which sets this apart from the excellent, but more angular Sous la Tour. 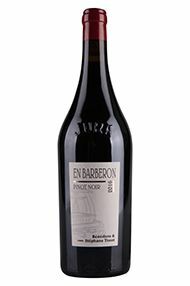 Stéphane recommends pairing En Barberon with duck or venison. 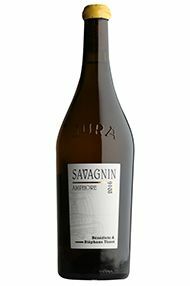 Again, he adds very little sulphur which, paradoxically, makes for an exceptionally durable wine, which will improve in the bottle for a decade or more.